This new Chromebook comes with an 11.6-inch IPS display and has the Intel Celeron 3855U processor under the hood, carrying a price tag of US$280. The touchscreen variant retails for US$50 more, and more powerful variants are expected to arrive soon. Acer's latest Chrome OS-driven notebook is now available for purchase, but only the low-end variants can be acquired at this time. In the future, variants with Core i3 and Core i5 Skylake processors are expected to hit the market as well. 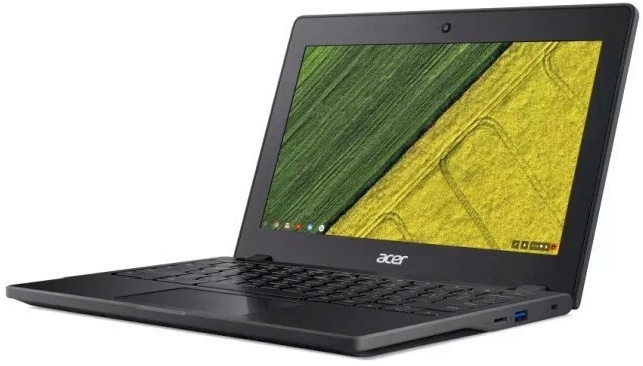 For now, those interested in an affordable, rugged Chromebook can get the Acer Chromebook 11 C771 or the C771T that comes with a touchscreen for US$50 more. The US$280 Chromebook 11 C771 has an Intel Celeron 3855U under the hood, and its 11.6-inch IPS display provides only 1,366 x 768 pixels. However, it comes with a spill-resistant keyboard, and it has been certified to comply with the MIL-STD 810G tests for ruggedness. Its specs and features also include up to 4 GB RAM, a microSD slot, USB Type-C, USB 3.0, HDMI connectivity, a 720p webcam, and WiFi 802.11 ac. Acer Chromebook 11 C771 weighs about 3 pounds and is around 0.8 inches thick. As usual, it should be available for purchase from Acer or via Amazon.